Jansson's Temptation is a traditional Christmas recipe in Sweden. However, at home in our house, we also eat it at Easter time because it simply goes so very well with roast lamb. 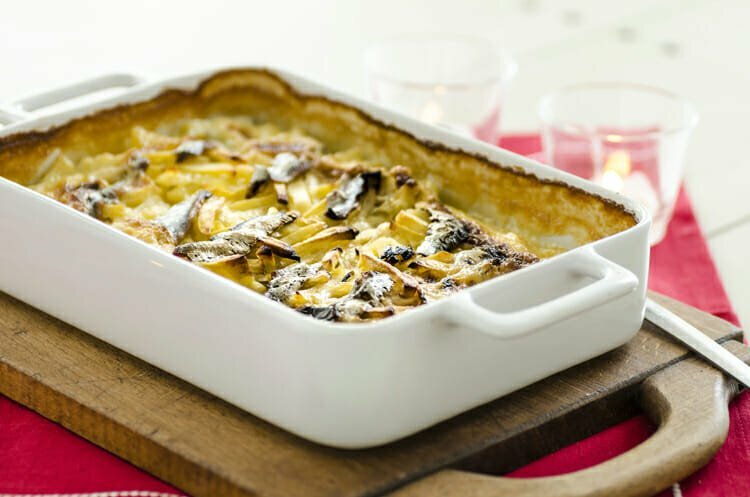 It's a creamy, tasty potato gratin with bags of flavour from the fish. Do try it and I promise your taste buds won't be disappointed. A perfect addition to your Easter Smorgasbord or as a side dish with your Easter Roast Lamb. Do get the right 'Sprats' Anchovis to go with this and do not be tempted to use the anchovies from southern Europe as these are too salty. Heat the butter in a saucepan and add the onion and cook until soft (a few minutes, taking care not to burn). Add the potatoes and leave for another few minutes to start the cooking process. Take off the heat. In an ovenproof dish add half the potato/onion mixture, then place about 10 sprat fillets evenly across. Season with salt and pepper. Add another layer of potato—onion mixture and the rest of the sprat fillets. Add 200ml of the milk-cream mix to the dish and sprinkle breadcrumbs on top. Season again. Bake for about 45 minutes or until the potatoes are cooked. Half way through, check the moisture level and add the rest of the milk-cream mix. If the dish feels a bit dry you can add a bit more milk. You want a creamy consistency. Tip: Don't peel the potatoes and keep in water for a long time: You want to contain the starch. Cook as soon as you have peeled them.